Geneticists hope their stem cell research will find new drugs against this debilitating disease. 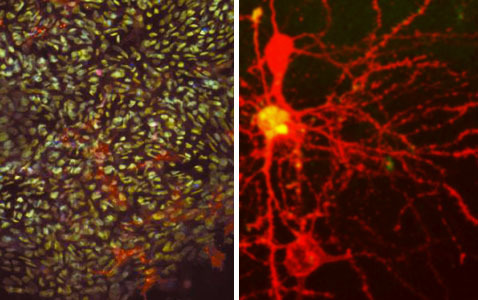 Scientists turn skin cells into stem cells (left), and then into neurons (right), and now wait for them to die. Scientists have achieved the tricky task of transforming skin cells from Lou Gehrig’s disease patients into stem cells. This breakthrough may speed the search for a cure for Lou Gehrig’s disease, which slowly and inexorably destroys nerve cells. Using the stem cells, researchers can observe the progression of the disease replayed in a Petri dish and test a battery of experimental drugs aimed at halting nerve cell death. This development will soon allow scientists to examine the events that cause nerve cells to die, says Dr. Robert Brown at the University of Massachusetts Medical School. Brown has studied neuromuscular diseases for about 30 years but was not involved in the study. Lou Gehrig’s disease, also known as Amyotrophic Lateral Sclerosis or ALS, afflicts about 5,000 new people every year in the United States. It kills 90 percent of them within five years of diagnosis. ALS patients gradually lose the ability to walk, eat and even breathe as the nerve cells that control muscle activity, called motor neurons, waste away. The genes that are associated with Lou Gehrig’s disease are only known for 10 percent of all cases. Until now, the only window into the role genetics plays in the disease’s progression was a breed of lab mouse that develops ALS. In the mouse model of ALS, a single gene is responsible for the disease. In humans, a similar gene is thought to be responsible for only about one percent of ALS cases. To create a better model for understanding ALS, researchers at Harvard and Columbia Universities took cells from the skin of about 20 ALS patients and reprogrammed them into stem cells. Like embryonic stem cells, reprogrammed stem cells have the ability to become any cell in the human body. “It’s actually quite difficult, but for almost every patient who’s given us a skin biopsy, we have been able to reprogram their cells [into stem cells],” says John Dimos, the lead author on the study recently published in the journal Science. Dimos is now a senior scientist at iZumi Bio, a biotechnology company in Mountain View, Calif.
Next, the researchers stimulated the stem cells with small molecules and turned them into motor neurons, the cells affected by ALS. Each patient’s batch of motor neurons carries a unique genetic profile that is responsible for ALS. The researchers hope to study ALS in the context of these different genetic profiles. They do not know how different genes associated with ALS might influence events inside the cells that cause them to die. But, by using this system, they can start to examine what goes wrong inside the motor neurons as they age from the earliest stages. Depending on what they observe, they can choose drugs from the thousands of potential candidates and screen them against the stem cell-derived neurons for ones that prevent them from dying. However, even before researchers can start looking for new therapeutics that ameliorate ALS, the scientists must confirm that the reprogrammed motor neurons deteriorate under laboratory conditions like they do in the bodies of ALS patients. “The disease can take 35 to 40 years to develop in patients, which is not useful,” notes study collaborator Hynek Wichterle of Columbia University’s Center for Neurobiology and Behavior. To make the process a valuable tool for lab researchers, they hope to see cell death within days, he says. Previous work from the teams at Harvard and Columbia suggests several molecules can accelerate the motor neuron death seen in the disease, offering shortcuts for the researchers. The ultimate goal of the stem cell research plan by Dimos and his collaborators is to create healthy motor neurons in a Petri dish that doctors can put back into the ALS patient. “That’s a long, long ways away, and I think it would be cruelly misleading to suggest anything else,” says Dr. Robert Brown at the University of Massachusetts Medical School. Experts are quick to point out that many obstacles remain, like ensuring that the transformed cells remain motor neurons. In addition, while the ALS system appears to be a breakthrough, the scientists still think it leaves room for improvement. “This system is Version 1.0,” cautions Kevin Eggan of the Harvard Stem Cell Institute, who oversaw the study. His immediate goal is to determine how the induced stem cells created artificially from skin cells differ from embryonic stem cells that occur naturally in the body. As the technique improves, Brown predicts that the induced stem cell system will allow researchers to make great strides forward in the study of other brain diseases, such as Alzheimer’s and Parkinson’s, as well as degenerative muscle, heart and liver diseases. “It’s almost as big as human biology itself. It’s such a huge area now, with so much explosive growth,” he says. Visit stem cell scientist Hynek Wichterle‘s lab. A new way to make stem cells. Chimera controversy: mixing species together for better stem cells. Good job pointing out the directions Bob Brown and Hynek Wichterle are taking to utilize stem cells to look for abnormal processes in ALS and other diseases. We are all anxious to see what comes of this.